There is not a cloud in the sky as I type this in beautiful, sunny Minnesota. Friends and family straight south, however, get no relief. The rain continues over Texas and Louisiana. This hurricane is breaking records you don’t want to see broken. My social media feed is flooded with prayers. Pictures, hashtags, prayers. Yes, there are also calls to donate, and I’m sure many of us are doing so, but holy granola, the prayers. Now, before you get all riled up, yes, I pray. I have a prayer-filled life. Thanks to Anne Lamott, it consists mostly of, “Help, Thanks, Wow.” I like praying, because it reminds me I am connected to a larger universe which I can’t begin to fathom. I like being prayed for, because I’m narcissistic. Just kidding. Because it makes me feel better to know that others are thinking about me. It’s like a placebo. It’s a placebo, because here’s the thing: God isn’t mad at Texas. The universe isn’t ignoring the hurricane. Because if “prayer works,” then Texas would be dry by now. If millions of folks are #prayingforTexas, then it should just be over. But it doesn’t work like that. It just doesn’t. And every time you prop up the myth that it does, you’re hurting people. God isn’t Horton. One more little Who voice yelling won’t make God hear us. 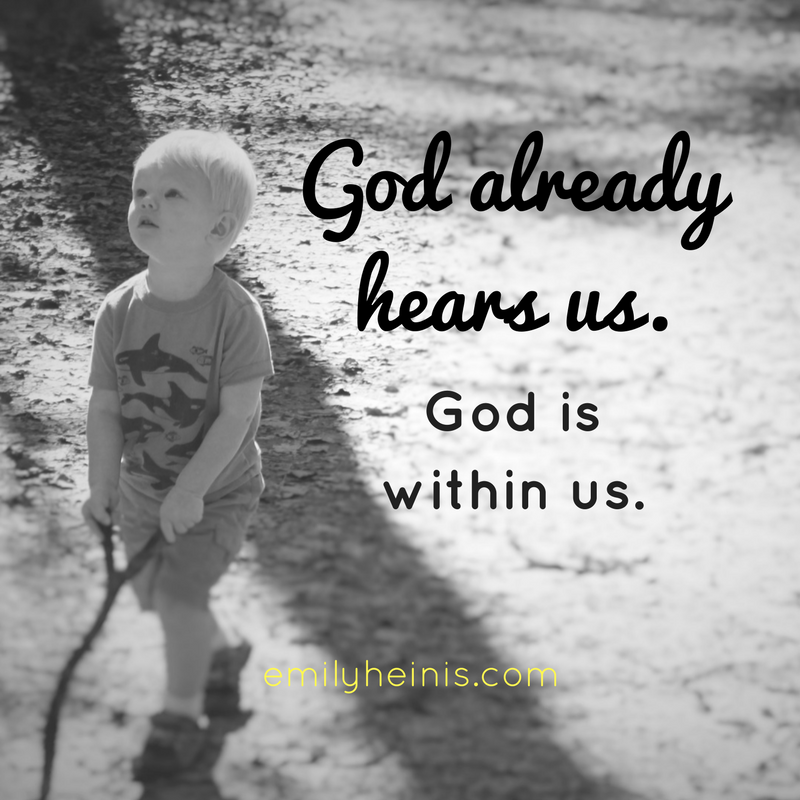 God already hears us. God is within us. Did she just say that prayer hurts people? No. I said that believing praying reallllly hard is what cured your friend’s cancer hurts people. That praying really hard kept the hurricane from getting bigger. That praying really hard will make Donald Trump resign. God is not playing favorites. Because if prayer saved your friend from cancer’s grasp, then lack of prayer is what killed my mom. “Poor woman. If only more people were praying for her.” Yeaaaah, no. While I’m at it, the same goes for #blessed. Having two healthy kids makes me LUCKY, not blessed. Because if I was blessed, it means that God favored me over my friend who has lost babies. Sorry, friend. You should’ve prayed more, then YOU would also be blessed. EH! WRONG! One more time for the people in the back: it doesn’t work like that. Pray for Texas. Do! It will make you feel good. Probably it will make Texans feel good, too. But here’s what else you have to do: help. If you want to make an actual difference, prayer just won’t cut it. You must donate, whatever you can afford. You must volunteer, whenever you can. And you must use your voice to make sure other people do the same. Don’t ignore the atrocities of this life. They are not God’s fault. Prayer won’t make them go away. Straight up action will.